Known as the birthplace of U.S. sport climbing in 1986, Smith Rock State Park wasn’t the easiest place for it to happen. The volcanic welded tuff of the area for the most part is soft and crumbly. A few choice walls of perfect stone make for some of the best routes in the country to rock climb, both sport and trad. Add to the mix the basalt columns in the Gorge with its jam cracks and stemming corners, and the range of fun stuff is only limited by the toughness of your fingertips. 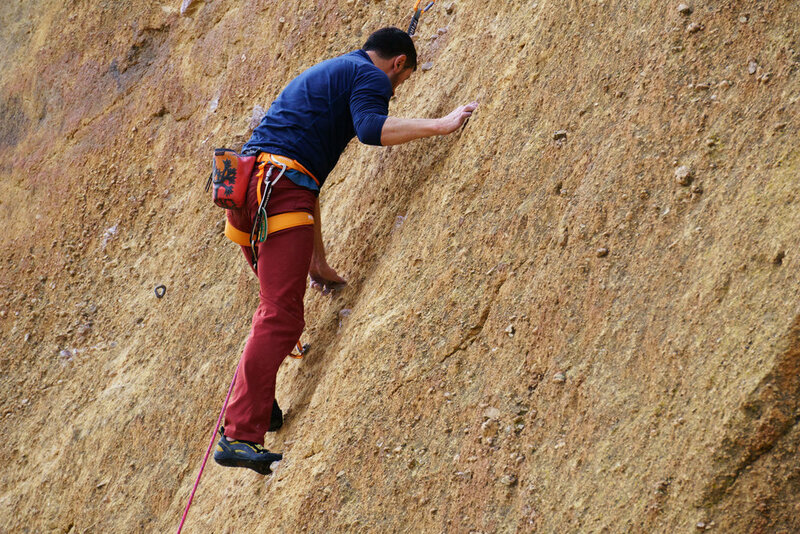 While most of the popular climbing routes can be done in one pitch, some top out at 600 feet. With close to 2000 routes ranging from fourth class to 5.14, you've got a lot to do. To get a preview of the climbing areas before you get here, we've got the big walls featured, how to get to them and 3+ star rated routes on each. The guidebooks for the area have it covered in detail, as do the knowledgeable guide services. Need a place to camp? There's a walk-in campground aka "The Bivy," as well as other options in the area. Bringing your dog? We love dogs, but the park's got rules, especially for climbers with dogs. Let's make sure everyone has a fun day at the crag.